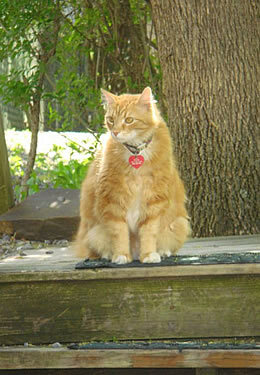 Visiting with our four felines is a highlight of any visit to Highlawn Inn. 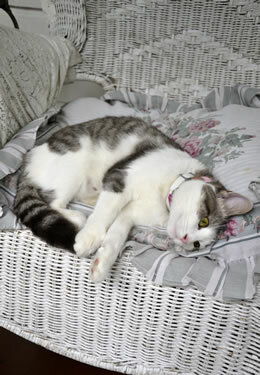 Chico (below), the resident Inn Kitty is our dignified senior guy who loves to go in and out. The garden is his favorite spot. 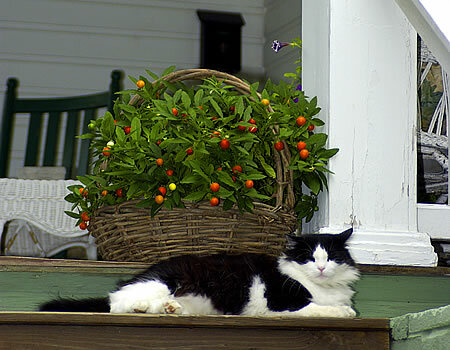 Peach (bottom left) is a 18-pound chow hound who likes to doze on the porch wicker chairs. Squawk (above) is solid gray and somewhat shy but responds well to soft voices. Little Girl (left) is the newest addition who runs to arriving guests for a petting. All four go in and out of the main building, so those with allergies may not be comfortable here.